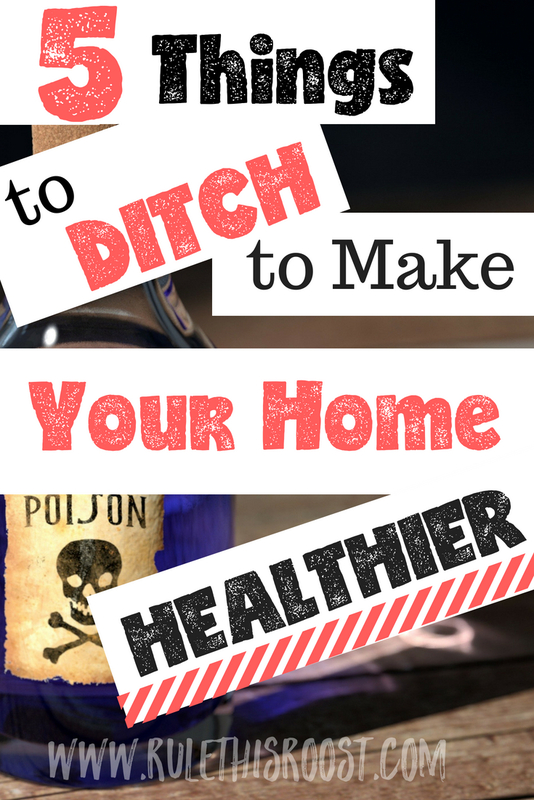 Are you looking to detox your house? Maybe you’re like me, and you didn’t even know you had toxic and poisonous things lurking in your house. Over the years, as I’ve done more and more research, I’ve become a little (understatement of the decade) passionate when it comes to NOT having chemicals in our house. I’ll never forget an intense argument between me and my husband because he had used the wrong dishwasher detergent (yes, I’m that passionate!). I didn’t want the chemical residue on the dishes that our kids were going to eat off of and he used it anyway! You guys, we almost divorced over it. Since that day, he’s gotten more on board with a chemical-free home, but it’s taken a lot of research and a lot of (respectful) conversations for us to make our home a 100% safe place for our kids. I grew up cleaning the house with commercial glass cleaners, wood polish, floor cleaners and regular old bleach. It’s a wonder I’m still here today (kidding, but not kidding). 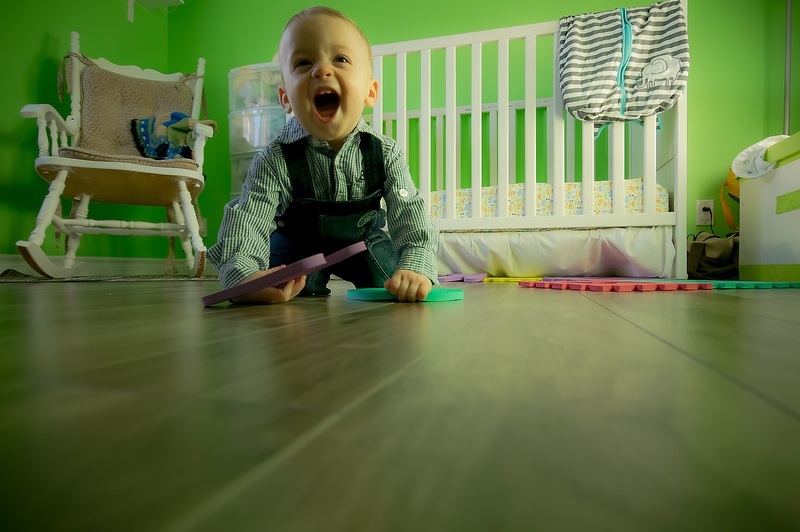 Do you really want your baby crawling on a newly bleached floor? Or your kids playing with Legos with their skin touching dangerous chemical? Why don’t I advocate for commercial cleaners? If you search on the Environmental Working Group website (ewg.com) for almost any well-known household cleaner, you will find that they are full of chemicals. The highest concerns for cleaners that I had been using include: cancer, asthma/respiratory issues, skin allergies and irritations and environmental concerns. That is a lot of possible side effects that you don’t want to bring into your home. While a lot of people link the strong smell of bleach and other cleaners to an immaculately clean house, I can only ever think of the array of chemicals and toxins that are, not only in the air, but also on every surface just “cleaned”. Disinfectant: When I want to disinfect something, my go-to is tea-tree oil. You can whip up a quick bottle of disinfectant spray by using 1 part water, 1 part vinegar and about 10 drops of tea tree oil. I also use tea tree oil in every load of laundry. 5 drops is plenty. If you don’t have time to make your own disinfectant spray, this non-chlorine bleach option is much better than regular old bleach. When my kids were crawling babies, I simply used boiling hot water with a few drops of tea tree oil to mop our tile floors. Of course, I only did this while they were sleeping to prevent injury. Wood Polish: If you have furniture that needs to be polished, a great alternative to commercial spray is olive oil. You can make your own furniture polish by mixing 1.5 cups olive oil and 1 cup of lemon juice together. Put it in a spray bottle and get to work! Window and Glass Cleaner: I will never go back to a chemical-based window cleaner. Like, ever. After using vinegar and water, I don’t understand why there is a need for anything else. Seriously, it’s that awesome. Mix 2 cups of water with 1 cup of vinegar and grab your rags. Even better than rags, use newspaper to clean your windows and mirrors. This weird tip will help combat streaks! 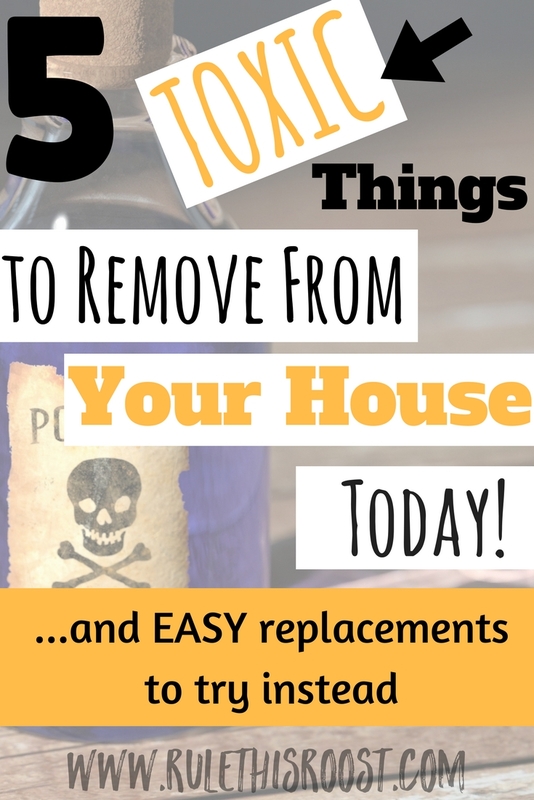 You can grab the cheat sheet for these safe household cleaners below! Drinking Water: If you have “city water”, you are mostly likely using a filter, either on your faucet, or in your fridge dispenser. Although those filters do work for some of the toxins in your drinking water, they do not filter out the fluoride in your water. In this study, on lifetime exposure of fluoride, the conclusion was made that fluoride is a neurotoxin and is very harmful to children (and adults). It impairs the brain’s development and can reduce IQ levels. Fluoride is found in tap water, as well as bottled water, and most filters DO NOT filter it out of water. If you have city water and would like to get rid of fluoride and other yucky toxins, this Berkey water filter comes with filters to remove fluoride. Our Berkey water filter has been absolutely amazing. We are finally on well water where we live, so we do not need the fluoride filter, but our water smells like sulphur! That means that it definitely does NOT taste good! The Berkey makes our water taste so pure that I would prefer it over any bottled water I’ve tasted. Bathing Water: In our first house, I remember getting a notice from the water company and an environmental control group that there was a *high probability* our water had been tainted and that there was a really harmful chemical in our water. A chemical that had been linked to cancer. Our kids bathed in that water daily! We filled the kiddie pools in the summer and they swam to their heart’s content! Their little bodies don’t process toxins like adults bodies do and these chemicals were soaking right into them. From then on, I was on a search to make sure our water was safe for them to bathe. I read about neutralizing chlorine with Vitamin C, and I immediately got online and ordered a bottle of the Vitamin C powder. It seems like an expensive cost up front, but it only takes 1 teaspoon a few minutes before your kids get in the bath, so it lasts a REALLY long time. Just before we moved out of the city, I was about to purchase this shower head filter and use it to fill the bath for the kids. I have not personally used it, but I have heard great things about it. It filters out bacteria, viruses, heavy metals, chlorine, chloramine, chemicals and fluoride. Here’s the deal– air fresheners are literally poison that you’re spraying into the air. Have you read the warning labels on the back? Do you see the warnings about ingesting the spray? Before we had kids, we had an automatic air freshener mounted to the wall over our cat’s litter box. We had a couple of bottles of it in the bathrooms and on the kitchen counter. We didn’t want our house to stink like animals, so we sprayed the heck out of it. I even had spray (or one of those little hanging trees) in my car so that I could keep it smelling “new”. Looking back now, it’s no wonder I always felt sick. A small space filled with toxins and chemicals. That can never be good. Every time that spray goes into the air, you are ingesting it. Your kids are ingesting it. The thought of my kids ingesting something with a massive warning label was enough for me to stop using it. EWG documented the highest concern (for a lot of air fresheners) as developmental and reproductive toxicity. That’s scary stuff right there. Hands down. Essential Oils. They smell great and are safe to use. There is a scent out there for even the most picky nose. My favorite scents are: Lemon, orange, peppermint, thieves, lavender and eucalyptus. We use this diffuser in our home and it has been awesome. It’s affordable and ours has been around for a couple of years now! After I bought the first one, I actually purchased two more so we could spread them throughout our house. Not only do we keep our home smelling good without pumping dangerous chemicals into the air, but they are also great for when illness strikes. So what about your car air freshener? Ditch it! This car oil diffuser is cute AND comes with washable pads that you can put your oils on. No need for that nasty car spray or vent plug. Just like air fresheners, candles and flameless wax burners pollute the air you breathe with fragrance and other harmful chemicals. Even without the harmful pollutants, I don’t really want to be breathing in any type of smoke and I don’t want my kids to be breathing it in either. So instead of using candles, we moved onto the flameless wax burners. Those are safe, right? WRONG! For years I thought that I was doing something right by burning scented wax bars instead of burning candles. I was so wrong! Burning scented wax bars puts off the same dangerous fragrance and chemicals that are in air fresheners and candles. If you can smell a fragrance, it’s in the air and is definitely polluting your breathing space! Again, we use essential oils when it comes to wanting our house to have a welcoming smell. To achieve the ambiance of a candle without polluting your family’s air, this flameless candle that is also a diffuser and looks just like a burning candle! Himalayan salt lamps also provide a beautiful glow AND knock impurities out of the air (literally) for a cleaner breathing experience. I gave this Himalayan salt lamp night light to my sister for Christmas and it is absolutely gorgeous. Bug spray and pesticides are absolutely a leading cause for chronic illness in adults AND children. In 2015, Harvard reported a link between pesticide exposure in childhood and cancer. That’s enough for me to NEVER spray pesticides anywhere, ever again. Not around my kids, near any places they play and definitely NOT on their skin. This also means that our pets are not doused in harmful chemicals. Not only is that unhealthy for them, but I don’t want my kids being exposed to the residual toxins. Pesticides infringe on our health, and also the health of other plants, animals and insects that are actually good to have around. Diatomaceous Earth is an amazing solution for pests. It is completely natural and can be used inside and outside. It can be used with a duster to sprinkle wherever you need to get rid of unwanted insects. I have dusted our dogs AND cats with Diatomaceous Earth to combat fleas and it really works! It can also be used for ants, bed bugs, cockroaches, earwigs, silverfish, crickets, millipedes and centipedes. If you aren’t familiar with DE, you can check out this informational post from PestStrategies.com, on how to safely use Diatomaceous Earth. For insect repellent on our kids, we opt for The Honest Company’s Bug Spray. We have used it for years and have always been pleased with how well it works. While it does take time and research there are so many great reasons and resources for having a chemical free home. If you are just starting out in your natural living journey, even picking one of these steps per week, or month, to put into place would make a huge difference for your family. Although the cost seems high up front to replace the toxic things in your home, I have found that the more naturally we live, the less our medical expenses are. We rarely get sick and only see the doctor for well visits. I attribute that to getting rid of unnecessary toxins so that our bodies can be healthy enough to fight off any illnesses. Where are you in your natural living journey? 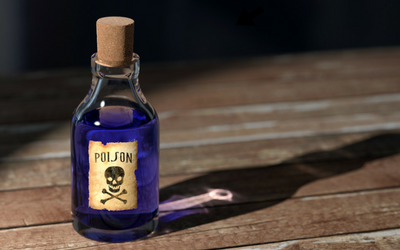 Have you ditched any of these 5 toxic things? Has it helped your family’s health? Comment below! Great post! I love these ideas. Thank you! !